Solo in B flat major for viola da gamba and b.c. 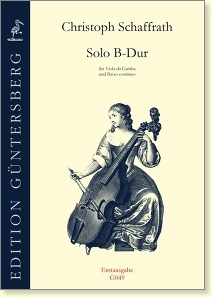 This solo Sonata is here published for the first time. As with the Sonata in A major by Schaffrath (see G048) it shows all attributes of the galant style but is technically less demanding. Well suited as an introduction to the literature of the Berlin School.